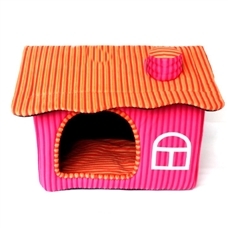 Adorable house for your darling pooch with candy stripe rainbow colors to cheer you and your pet during cold and gloomy days!Happy dog . . . Happy home! This is definitely a happy house for a happy puppy! Fully insulated to keep your dog warm in winter and cool in summer, this dog house provides that pride of ownership that dogs (and cats especially)enjoy as well as humans do! Yes, it's about time you gave your pooch some privacy!